Biologists immobilized Cinder and removed her from her den in February to examine her and replace the radio collar. Cinder, the bear that was rescued as a cub three years ago after being badly burned in the Carlton Complex Fire, is healthy and behaving like any other wild bear after her release two summers ago. The story of Cinder’s rescue, her long and painful recovery from severely burned paws, and her subsequent release into the wild has attracted public interest worldwide. Cinder the 1.5 year old female black bear after being rescued and from the Carlton Complex Fire in Washington in July 2014. 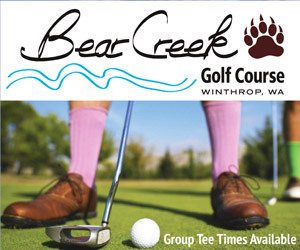 The spunky bear provided particular inspiration to Methow Valley residents in the wake of the devastating Carlton Complex wildfire. “This story became a source of strength and hope for the residents and victims of the fire in the Methow Valley. Many said, ‘If Cinder can make it, I can make it too,’” said Rich Beausoleil, cougar and bear specialist for the Washington Department of Fish and Wildlife (WDFW). So far, Cinder appears to be doing well in her home in mountains north of Leavenworth, said Beausoleil. He provided an update on Cinder last week after receiving inquiries about her. Cinder’s movements have been monitored through a GPS radio collar that transmits her location several times a day. 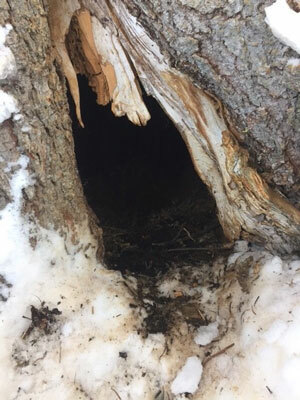 WDFW researchers replaced her first collar, which she wore when she was released, when they checked on Cinder in February while she was in her winter den — a hollowed-out silver fir tree at 5,000 feet elevation. 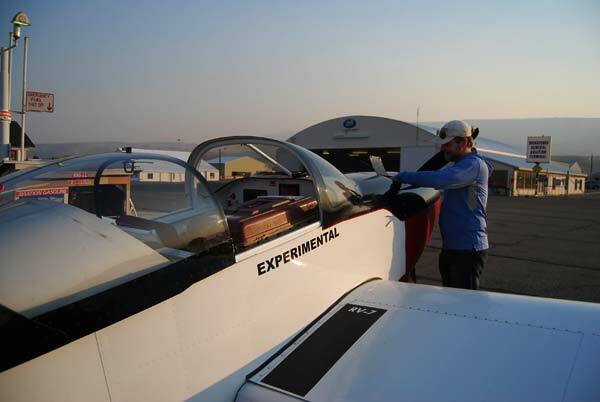 A photo of Bill Inman, the Seattle pilot who volunteered to fly Cinder the bear from Wenatchee, WA to Lake Tahoe, NV for burn treatment. Cinder is in the crate that is loaded where the passenger seat was before being removed to accommodate the crate. Researchers immobilized Cinder and removed her from her den to be examined. Weight is a key indicator of health, and at 110 pounds, Cinder was “a perfectly normal weight for a female bear at that time of year,” Beausoleil said. “Bears don’t eat while they are denning and typically lose about 25 to 35 percent of their body weight, so she may have weighed about 150 pounds prior to denning,” he said. Cinder has remained in the vicinity of her release, a heavily forested area about 30 miles north of Leavenworth. 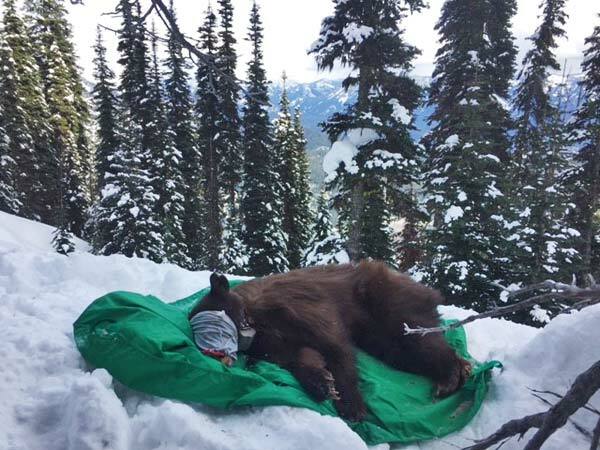 Usually, wildlife biologists return bears to the area they came from, but chose a different approach in Cinder’s case. Cinder was malnourished and dehydrated when she appeared in the yard of Steve Love’s home on French Creek on the evening of July 31, 2014, about two weeks after the Carlton Complex Fire swept through the valley. Her feet were so badly burned that she was crawling on her elbows and knees. Love gave her fruit and water, and when she whimpered in pain during the night he sat nearby and spoke gently to her. Cinder was captured the next day by WDFW officer Jason Day, who was able to outrun her and snag her with a catchpole. The emaciated cub, about 1 ½ years old, weighed only about 34 pounds — half what a bear her age should weigh. 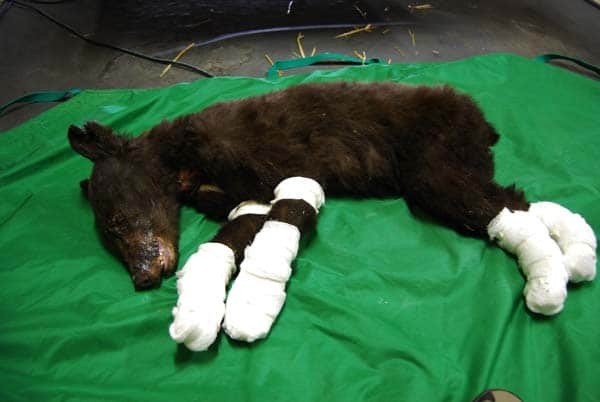 Beausoleil arranged to have the cub flown by a member of “Pilots for Paws” to Lake Tahoe Wildlife Care in California, where she spent more than three months being treated for her burns on her paws, face, neck and chest. For many weeks her paws were wrapped in bandages while they slowly healed. When she was sufficiently healed and healthy, she was transferred to Idaho Black Bear Rescue, a rehabilitation facility in Garden City, Idaho. She continued her rehabilitation there for another six months in preparation for her release. During her 10 months in treatment and recovery, Cinder’s caretakers described her with affection and admiration as a “cranky” bear with a distinctive, feisty personality. She loved eating grapes and clearly disliked humans. Cinder’s 2015-16 winter den where she spent 168 days. On June 2, 2015, after 306 days in treatment and rehabilitation, Cinder was transported back to Washington for release into the wild. She was fitted with ear tags and a radio collar and released into a remote area of the North Cascades. Cinder’s story had been followed by news media and social media around the world. She was adopted as the official mascot of Camp Eyabsut, a youth camp for burn victims held in North Bend. 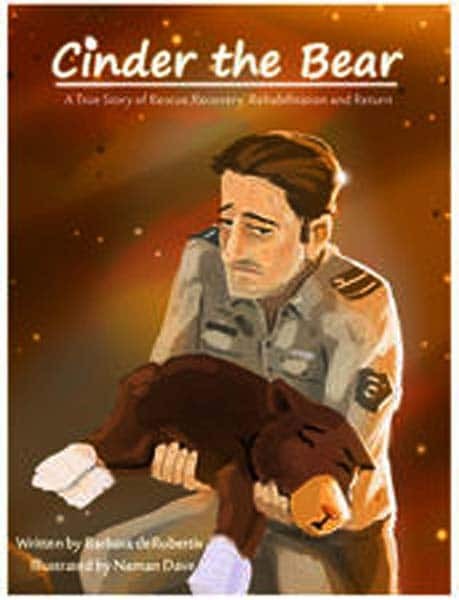 And her story became the subject of an electronic children’s book titled “Cinder the Bear: A True Story of Rescue, Recovery, Rehabilitation and Return.” Her release drew television crews from Seattle, reporters from regional newspapers and radio stations, and a CBS film crew from Los Angeles. When she was released she was 2 ½ years old and weighed a healthy 124 pounds, which is about 40 pounds heavier than normal for a female at that age, Beausoleil said. Cinder’s 2016-17 winter den where she spent 148 days. Cinder appears to have caught on well to life in the wild. Researchers visited her first winter den in June 2016, after she had emerged in the spring. 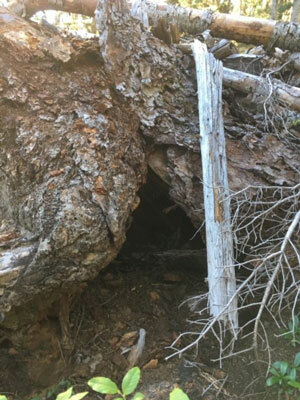 “The den was at the base of an Engleman Spruce tree at 4,400 feet in elevation. The den was well sheltered from the elements and the bear had done some minor excavation preparing the den, a typical ritual performed by most bears. In total, she denned 168 days, which is right with the average of other wild bears,” Beausoleil said. Researchers did not disturb her during her first winter denning period because the radio collar was expected to last for two years, and she was too young to have cubs. Cinder emerged this spring from her second winter of hibernation on April 12 after 148 days of denning, Beausoleil said. She is now 4 ½ years old, and Beausoleil said biologists expect her to have her first litter this coming winter. “In the wild, bears don’t have their first litter until they are 5 years old. Cinder’s fifth birthday is in January 2018,” Beausoleil said.